All little kids love repeatability, and it’s because they found it reassuring. How many time have you see a kid obsessed by a favorite blanket, or a favorite toy? Pretty much every child in the world goes through a “phase”. They get up in the morning and strarting to talk about their passion, to ask question about it, to play and pretend. Each game involves basically through their obsession. Having a burning interest in a particular subject can help children to make friends and relate to each other. Having something in common help to express their feelings without using so many words. It seems a kid’s interests are all or nothing. Children may have a bit of interest in other thing, for few minutes, but when it comes to these obsession subject, they know to spend an entire hour of fun and attention. Even if almost anything can trigger a new interest, most common “obsession phases”, are about Dinosaurs and Space. Try to not be annoyed by their passion. This phase is totally healthy, and if you help your son to feed it correctly, that passion can grow up in a great culture. Keep their passion continuous is very important. Kiwee Club, as always, care about your children. 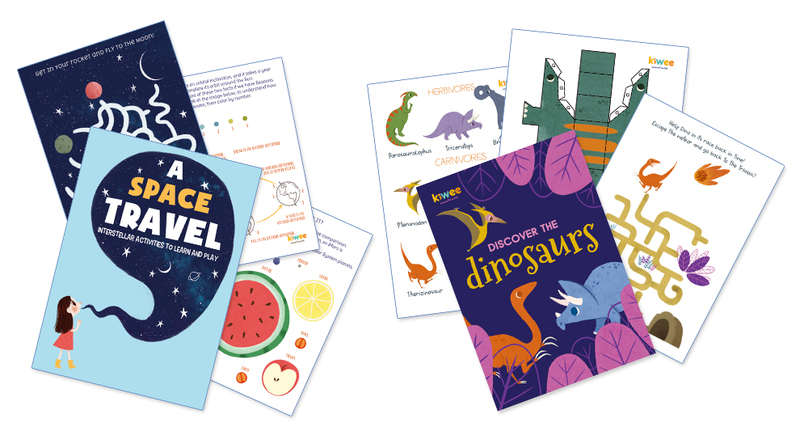 In our store you can find a lot of Activity Books nearly related to scientific subjects. Inside Activity Book A Space Travel, both informative and fun, your son will find a lot of info about the night sky, the solar system, individual planets, ISS, aliens, space ships, moon, constellations and facts truly fascinating, games, pre-writing activities, maze game, and many more. It also contains a rocket to build and an A3 Solar System Wall Art, to hang on the wall of his room. Is your little one fascinated by dinosaurs? Are you trying to find a book that is neither too simple nor too difficult? We have designed this book to be informative but also colorful, with some activities suitable for children from 2 to 7: Activity Book Discover the Dinosaurs , that contains fun facts, games, color by number, informations, craft instructions and a final prehistoric test! Now share with us you son’s obsession, we are open to asses your ideas and needs!